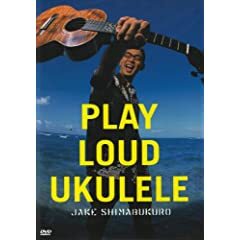 Play Loud Ukulele is one of Jake Shimabukuro‘s two DVDs. This video is great because there are lots of opportunities to watch his fingers. I still have yet to see a better ‘ukulele DVD. The concert part of the video includes most of Jake’s pre-2004 hits. The other part of the disk is full of music videos and lessons from Jake himself. In the lessons he teaches some of the techniques that he often uses including the legendary ten-finger strum! He also shows how to play the Beatles’s Yesterday. Songs: Toastman’s Dilemma, Equator, Sunday Morning, Skyline, Europa, Toastmaker’s Revenge (what is it with this guy and toast? ), Spain, and Crazy G.
Music Videos: Crosscurrent, Toastmaker’s Dilemma, and Wish upon my Star.